Will the Kiwi Selloff Last? 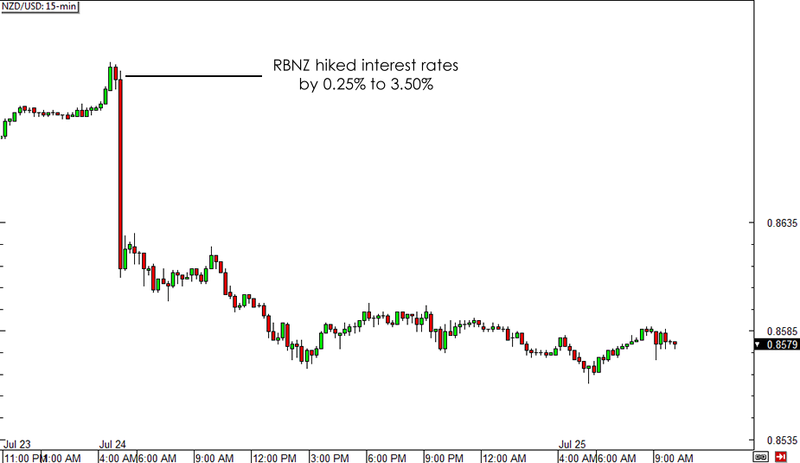 As expected, the RBNZ hiked interest rates by another 0.25% in their latest policy statement. But why aren’t traders showing any love for the Kiwi? As you can see from the 15-min chart of NZD/USD below, the pair dropped by close to a hundred pips right after the announcement then continued to edge lower for the rest of the trading sessions. With that, analysts priced in lower odds of seeing another rate hike in the next few months, as some projected that the next increase might not happen until March next year. After all, inflationary pressures have been subdued, particularly among wages and in the dairy sector. In fact, falling commodity price levels have been such a persistent concern for the RBNZ that they decided it’s time to jawbone their currency again. According to the central bank’s official statement, the trading level of the Kiwi is “unjustified and unsustainable” and there is “potential for a significant fall” as it has to adjust to weakening commodity prices. This isn’t something new from the RBNZ, as Wheeler has a record of jawboning and has even staged a secret currency intervention last year. At that time, NZD/USD had been trading around the .8700 levels and dropped by roughly 300 pips in a few days. If the RBNZ is all bark and no bite though, it won’t be long before market participants realize that the New Zealand central bank can’t afford to intervene in the currency market for now. Who knows? Perhaps Wheeler and his men are simply waiting for the Kiwi rallies to retreat before going on another rate hike streak. For now, the shift in the RBNZ’s stance to a more cautious one could keep any Kiwi gains at bay. It doesn’t help the higher-yielding commodity currency that geopolitical tension has allowed risk aversion to extend its stay in the markets. Sooner or later though, market participants could be drawn back to the positive interest rate differential of buying the Kiwi against lower-yielding currencies and allow the longer-term climb to resume. Do you agree that the Kiwi’s recent selloff was just a huge correction? Share your thoughts in our comment box or cast your votes in our poll below!